Nelson Ireson July 13, 2011 Comment Now! The Chevy Volt got a bad rap when it finally reached retail, after a few outlets got in a tizzy about the onboard engine actually contributing some power to the wheels under certain circumstances. Despite the confusion and misinformation that followed, the underlying range-extended electric vehicle technology is not only sound, but is set to underpin the next generation of ultra-efficient cars from several brands, including BMW, Audi, and now, Volvo. Extended-range electric vehicles (EREVs), also known as series hybrids, all share a similar basic format: an onboard engine/generator of some sort that powers a battery pack to drive an electric motor. This week, Volvo gave us a preview of what to expect from its next round of range-extended electric powertrain development in the form of three "technical concepts." 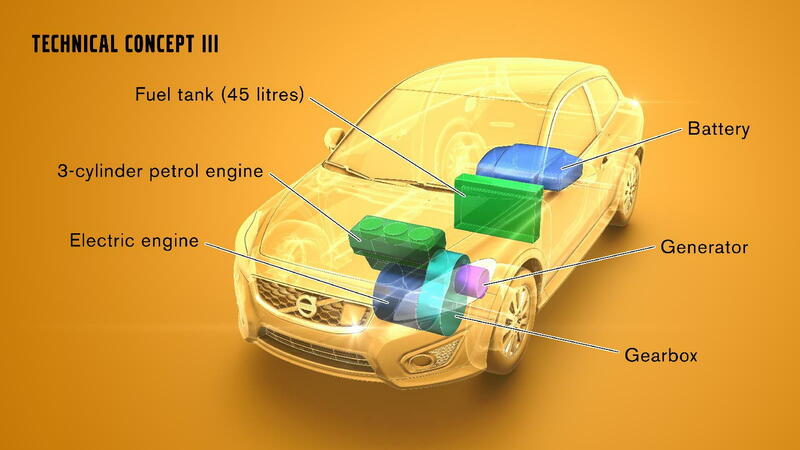 Both Technical Concept I and II are based on a C30 hatchback platform, while Technical Concept III uses the V60. Technical Concept I employs a three-cylinder, 60-horsepower gasoline engine that generates electricity to power a 111-horsepower eletric motor powering the front wheels. A unique feature lets the driver divert some of the engine/generator's power from the drive system to be stored in the battery pack, effectively slow-charging the battery on the move. The engine itself never directly powers the wheels. Volvo says this concept's battery pack is good for 70 miles of all-electric range, and another 620 miles on its 10.5-gallon tank. That works out to an average of 59 mpg in range-extended mode--considerably better than the Volt's 37 mpg rating in range-extended mode. Technical Concept II uses the same basic layout as Technical Concept I, but boosts the three-cylinder's output to 190 horsepower and allows it to power the rear wheels (it's rear-mounted) directly through a six-speed gearbox. The electric drive motor at the front can power the front wheels separately or together in concert with the gasoline engine. The latter arrangement is known as a "through the road" hybrid. Total combined horsepower is just over 300. Volvo says 0-62 mph acceleration takes just 6 seconds, making this our kind of hybrid--all-wheel drive, quick, and still efficient. Volvo rates the II at the same 59 mpg in gas-only mode, but it only delivers 47 miles of all-electric range. 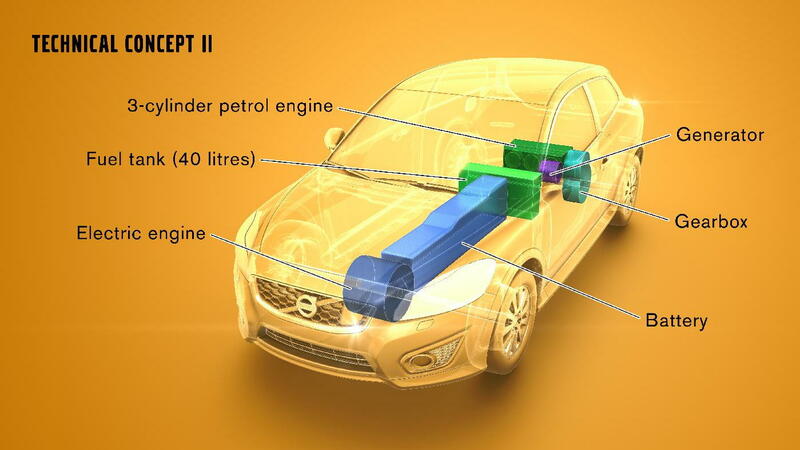 Technical Concept III deviates from the EREV model by going the more familiar plug-in hybrid route. In fact, it's an adapted form of the V60 Plug-in Hybrid wagon. Like the Technical Concept II, the V60 plug-in is a "through the road" hybrid, and is able to power either the rear wheels through the diesel engine, the front wheels from the batteries and electric motor, or both. The Technical Concept III does away with this feature, bundling both the electric motor and combustion engine up front under the hood. It splits the power used by speed rather than by axle: up to 31 mph, the III is all-electric; beyond that the combustion engine takes over and drives the front wheels while recharging the pack. The Technical Concept III is good for 31 miles of all-electric range. So far, Volvo has given no timelines for testing or launch of any of the three concept drivetrains, though as John Voelcker notes at GreenCarReports, Volvo has said it will test a modified V60 plug-in hybrid in the U.S. once it has adapted it to use a gasoline engine instead of the diesel it uses in Europe. That vehicle could be the Technical Concept III. If that proves to be the case, it could be on the road as a prototype within a year. The standard V60 diesel plug-in hybrid will be on sale on a test-fleet basis in Europe in late 2012.